Menendez made the campaign kickoff announcement at a packed high school gym in Union City, New Jersey with nearly every state Democratic luminary in attendance, the New York Times reported. His speech, which was partly delivered in Spanish, presented his record as proof that he will take on President Donald Trump's policies. "There is a president in Washington who spends his days dividing us and distracting us, but never delivering for us," Menendez said. Menendez was accused of carrying out "official favors" for his friend and mega-donor, Florida eye doctor Salomon Melgen, in exchange for private jet flights, vacations, and hundreds of thousands of dollars in campaign contributions. Federal prosecutors alleged the senator started taking bribes from Melgen shortly after he entered the Senate in 2006, but last November the judge declared a mistrial after the jury could not reach a unanimous decision on the charges. As recent as January, it was uncertain whether Menendez would even be on the stage running for office again. Shortly after Menendez' mistrial, the Department of Justice announced it would retry the case, which led to the federal judge who oversaw the trial acquitting the senator of several charges, hampering the retrial effort. Within days, the Department of Justice dropped the case completely. Menendez appeared unperturbed by the previous charges while at Wednesday's rally, according to the Times. If Mr. Menendez was ever worried about his political future, he seemed determined to dispel any notion of that on Wednesday. His surrogates on stage for the rally in the town where he began his political career as a school board member while still in college read like a who’s who of New Jersey Democratic politics: Senator Cory Booker, Gov. Philip D. Murphy, Brian P. Stack, the mayor of Union City, and John Currie, the state party chairman. "I asked the question this morning, where would we be without Bob Menendez?" Mr. Murphy said. Nearly the entire 2,800-student population of Union City High School, excused from four periods of classes, packed the gymnasium to the rafters, waving campaign fliers and bopping to Marc Anthony and Luis Fonsi. Members of the New Jersey Republican Party stood outside the rally passing out "get out of jail free" cards, which featured Menendez' face added to the body of a cartoon prisoner. Menendez has a pretty clear path to winning the Democratic nomination, after which he will likely face Republican challenger Bob Hugin, a former pharmaceutical executive with ties to former Republican Gov. Chris Christie. The race has the potential to be a competitive and expensive race, the Times notes, which would likely benefit Hugin because of his deep pockets. 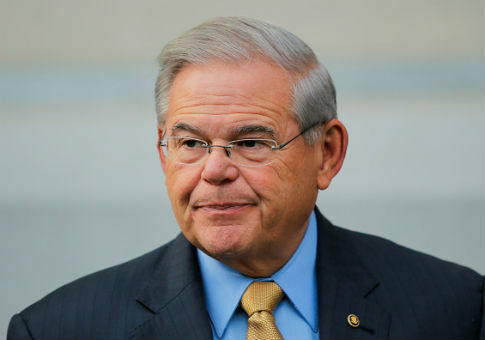 While Menendez' path to the Democratic nomination seems likely, a lack of enthusiasm among Democrats for the senator could negatively affect other Democratic nominees running in the state. Despite the potential lack of enthusiasm for Menendez, his name at the top of the ticket is seen as a key draw to mobilize Democratic voters. This entry was posted in Politics and tagged 2018 Election, Bob Menendez, Corruption. Bookmark the permalink.